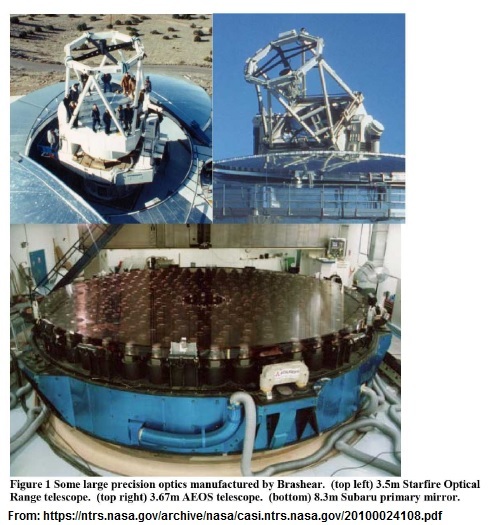 From John Brashear to 21st Century Optics and Telescopes, by Blaise Canzian, Ph. 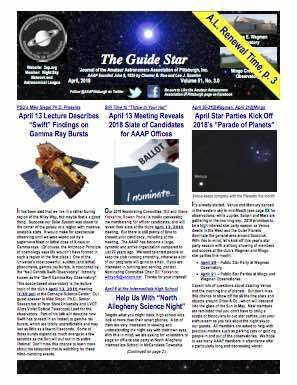 D.
The public is invited to the Amateur Astronomer’s Association of Pittsburgh’s Monthly Meeting Lecture, Friday, May 12, 2017, 7:30 PM, at the Science Stage of the Carnegie Science Center, Pittsburgh, PA 15212. Telescopes have evolved both in technology and mission since the early days of John Brashear’s company. Today’s telescopes are tasked with satellite laser ranging, laser satellite communication, challenging astronomical research, and satellite imaging. Complex engineering combined with new technological advancements in optic fabrication have expanded our space situational awareness and enable astronomers to explore the universe like never before. Times: Safe solar observing; 6:30 PM – Night sky observing; approximately 8:30 PM (Weather Permitting for observing). Planetarium Presentations will occur rain or shine starting at 7:30 PM. * There will be safe observing of the Sun beginning approximately two hours before sunset through the 4” Lunt Hydrogen Alpha telescope. * After dusk using both the 10” D & G Refractor and the 24” Optical Guidance Systems Reflector telescopes, observe the wonders of the April night sky. Some objects observed may include views of Jupiter and its moons, Mars and the craters of the Moon. Many deep sky objects may also be observed such as the Ring Nebula and other nebulae, clusters and double stars. * Presentations about current events in astronomy and the Mingo Creek Park night sky will take place in the Richard Y. Haddad Planetarium at various times throughout the night. This month Fred Klein, AAAP member and astro-photographer, will be giving his presentation “What YOU can see of the Solar System”. The Mingo Creek Park Observatory is handicap accessible. There is no charge for your visit, but we gladly accept donations to cover operating expenses. There is no reservation needed and there is no limit on group sizes. NOTE: Mingo Creek Park Observatory and its grounds, as a part of Mingo Creek County Park, are a no smoking and no alcohol permitted area. Mingo Creek Park Observatory is operated by an all-volunteer staff of members of the Amateur Astronomers Association of Pittsburgh.